Sovereign pension fund is a fund established by national authorities to meet of pension liabilities. In Malaysia, there are 2 sovereign pension funds namely, Employees Provident Fund (EPF) and Kumpulan Wang Persaraan (KWAP). However, only EPF was listed in top 26 largest Sovereign Pension Funds. The data shown here are as of end 2012 & early 2013. EPF down 1 spot from 6th spot in 2012 to 7th spot in 2013 with total assets grew from $153.9 billion to $175.7 billion or 14.2%. 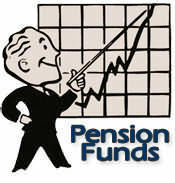 The top spot retained by Japanese Government Pension Investment Fund with the fund size exceeding $1.29 trillion. The table below is top 26 world’s largest sovereign pension funds.